Descriptions of the End Times are full of violent imagery, of mass destruction through earthquakes, tidal waves, fire and ice. These images are written deeply into our culture through the book of Revelation, but are by no means limited to the Christian imagination. Often, our idea of modern millennial groups is informed by images of violent confrontations between them and the state, for example at the Branch Davidian compound in Waco, Texas, or of mass suicide, such as with Heaven’s Gate or the People’s Temple at Jonestown. Are we right to connect millennialism and violence? Are these groups typical, or rare exceptions, magnified out of proportion by the lens of the media – and scholarship? How do we account for the popularity of millennialism outside of religious traditions, new, extreme or otherwise? This audio/visual episode was produced in collaboration with CenSAMM, the Centre for the Study of Apocalyptic and Millenarian Movements. You can download this interview, and subscribe to receive our weekly podcast, on iTunes. If you enjoyed it, please take a moment to rate us. And remember, you can use our Amazon.co.uk, Amazon.com, or Amazon.ca links to support us at no additional cost when buying academic texts, pretzels, and more. Podcast with Eileen Barker, Moojan Momen, Joseph Webster and Tristan Sturm (22 May 2017). Transcript available CenSAMM conference – Millennialism and Violence 1.1. David Robertson (DR): Welcome to the Religious Studies Project. I’m here today, in the grounds of the Panacea Museum in sunny Bedford, for the inaugural CenSAMM conference on the subject of Millenarian Groups and Violence. I’m joined today by Moojan Momen, by Joseph Webster, by Eileen Barker and by Tristan Sturm. And we’re going to discuss the issues around millenarianism, millennialism and violence. And all of the talks from this conference have been streamed and there’ll be a link to that below. But just to get the ball rolling, I’m going to ask: what is it we’re talking about? I mean “millenarianism”, “millennialism”, “apocalypticism”: are these different terms? What do they mean? Joe, maybe you could get the ball rolling on that? Joseph Webster (JW): OK, yes. It’s an interesting question. I’m not so sure that I have a clear answer, possibly because a clear answer doesn’t exist. I think these terms have been used for a very long time, interchangeably. Sometimes, that’s because of potentially sloppy scholarship on behalf of those who are using the terms. On the other hand, part of the answer might be that these terms – particularly millenarianism and millennialism – have been, to some extent, interchangeable. The OED – which isn’t the final word on these conversations but still, nevertheless – the OED does define these terms as synonyms. The way that millenarianism is used in anthropology – the discipline that I come from – tends to see millennialism as more distinctly Christian than millenarianism; millenarianism being treated as a broader term that has resonances with the Cargo Cult literature and the Ghost Dance literature. However, again, that’s not universally true. Some scholars within anthropology do use millennialism as a way to refer to Cargo Cults and the Ghost Dance. So, whilst I don’t think there’s any clear definitional answer, my assumption would be that the best way to proceed is how the groups themselves use these terms. And they don’t, actually, tend to use of either of those terms for themselves. So let’s take it from there. Tristan Sturm (TS): I would add to that “apocalypticism”. And I think we can think about apocalypticism versus millennialism – which is the distinction I would use – as two sides of the same coin. The Apocalypse or apocalypticism, meaning unveiling, happens before the Millennium: 1000 years, or a period of time after which the world ends. So, I would understand it that way; I would teach that to my students. I would say apocalypticism is the events before the sort-of Revelation – or the end of the world – and the Renewal is the Millennium. That’s how I would understand it. And I think, using apocalypticism versus millennialism is important in certain cases. Apocalypticism is useful, of course, for various secular movements who don’t believe in a Renewal, a new world, right? Whether that would come from climate change; Trumpism – potentially – for some individuals; and for others, equally, Barrack Obama, right? That doesn’t have, necessarily, a Christian or any religious overlay over it. We can still use the term apocalypticism – and I think many social theorists do – to talk about things like climate change and the severity of the series of events that would happen from that. DR: We’re often, when we hear about apocalypticism, millennialism, we’re often hearing about these cults, these controversial new religious movements. Eileen, maybe you’d speak to this? Is there some necessary connection between new religious movements and apocalyptic millennial thinking? DR: Then why is it so often connected in the public mind? EB: Well, it’s quite frequent that millennial groups, or millenarian groups or apocalyptic groups will be termed cults. And cults, sort-of technically, usually means some kind of religious or non-religious movement that’s in tension with society in some ways. There’s a sort-of classic division between the cult and the sect, which are in tension with society and a denomination of the church, which aren’t. But, technically, that’s one thing. But just generally, in popular parlance, to say something is a cult means: “it’s a religion I don’t like”. And it’s not really very much more than that. (5:00) I mean, I often get asked: “Is it a real religion, a genuine religion, or is it a cult?” And you’ve just got to say, “Well, what do you mean by a cult?” and one man’s, or one woman’s cult is a another person’s religion. Nobody says, “I belong to a cult.” Not seriously. They might say it as a joke, or in self-defence. Now, some of these movements on which people put the label of cult are millenarian, but most of them are not. Well, I wouldn’t like to say how many are and how many aren’t, but the two don’t necessarily go together – except that it’s more likely that the millenarian groups are a sub-group of cult. But you get millenarianism in denominations and in church – if you’re just looking at the tension with society – so it goes either way. You’ve got to be terribly clear what you’re talking about. And sometimes such categories are useful, but quite often they just obscure. EB: So, say what you’re talking about! Moojan Momen (MM): And I think we need to bear in mind that, even Christianity itself , when it first arose – if you read the Gospels – you’ll see there that they are talking about how Christianity is fulfilling prophecy. So Christianity is, therefore, a millenarian movement in Judaism and was probably regarded as a cult by other Jews. So, we’re talking about a history of religion developing gradually from being a cult, to being a sect, to being a religion. DR: And how important is prophecy? Is this an essential aspect here? EB: I think so, almost by definition. Because you’re expecting something to happen. So you have some kind of knowledge that’s come from somewhere. Now it might just be in your own little brain, but usually there’s somebody who says . . . or a book or something that can be read as saying . . . . So, there’s some sort of “saying” what’s going to happen in the future. It’s future-oriented. DR: Yes. But it’s not entirely about the future? EB: Oh no. No, I’m not saying that. It’s necessary but not sufficient. DR: It’s a good in. JW: Yes, I think that’s right. I think one of the key aspects to whether we’re talking about millenarian movements, or apocalyptic movements, or millennialism, is the way in which temporality and time are really central to what’s going on. And crucially, I think, the way in which parts of time, which we customarily think of as very distinct, actually end up collapsing into each other and becoming conflated. So: the present being seen as a very unique moment when prophecy is being fulfilled; when things that were said of the future are coming to pass right now; but also that the present is seen as deeply resonant with an ancient past. Look at the way in which the Christian groups, for instance, that are most dispensational – groups like the Brethren, the Jehovah’s Witnesses, some Baptist groups – certainly look at today’s age as morally bankrupt and immediately reach back into the Old Testament past for examples of the same: Sodom and Gomorrah, the days of Noah, the days of the Tower of Babel. And, immediately, what that does is it transforms the present into something that is not only future-oriented, but is deeply indebted to, and is seen as a replaying of ancient past Biblical events. EB: Of course the Abrahamic faiths, Islam, Christianity and Judaism, have a linear view of history: that there’s a past, we’re in present and there is a future. And they’re promising something about the future. But we should remember that a lot of new religions, cults, sects, traditional religions, are cyclical. And they see time in this sort-of birth, death, rebirth etc. Now, sometimes it’s an upwards spiral. Sometimes you go through various ages. But they’re not just sort-of straight lineal like they are in the Abrahamic [faiths], which lend themselves more to apocalyptic visions because there’s something happening. But within Hinduism you can get different ages, which can be very different. And the New Age, indeed. There’s something very fundamental that’s changing in society, which is what’s expected in these kind of movements. TS: I would agree, but I also think, prior to say the Enlightenment, prior to Hobbes or someone like that, you would see, I think, a cyclical idea within Christianity, still. (10:00) I’m taking this from Reinhart Koselleck and he says, you know, the ideas of the Apocalypse didn’t really emerge in the everyday life of Christians until, really, the period of the Enlightenment, with the idea of progress, and the Kantian idea that because the past is different, the future must also be different. And so we get this idea that the Apocalypse isn’t part of a cycle, a scaled-up everyday cycle of seasons, that we would see with a lot of individuals. So, I think there is a change actually happening around the end of the 16th century, where we’re moving even out of a Christian cyclicalism to a more linear idea of the future. And I would add to that that I think now the future is becoming more important. And it’s been studied I think, even across disciplines, it’s becoming this tag term, that we’re trying to theorise now. And I think here of Susan Harding, for example, who talks about “memories of the future”. And she talks about, you know, that the future is a kind of memory. We have an idea of the past and those are kind-of memories as well, outside of history. We’re selective about the memories that we want to bring to the present and give continuity to the way things are. In the same way, we do that with the future. We kind-of know how the future’s going to play out. We have a sort of selectivity of ideas. There are certain paths that we’re pretty sure are more likely to happen that others. And we go down those paths. And prophecy functions in a similar way. It tries to close off the way the future could go. It sort-of says, “Well, this is the likely space that the future will go.” And so it’s closing off of the future. And we have a kind of memory of the future. We re-member ideas from the future. And we all do this. We do this with our jobs, how we foresee our lives are going to go. And they more-or-less do take place the way we probably thought that they would, given a certain level of difference there. And so, I would say that about time. And I also . . . and there’s a book that I really like. It’s called “The Past is a Foreign Country” and he says that we’re selective about our pasts. But I would say that the future is also a foreign country where we’re selective about the future that we want to bring, to give meaning to our present. And, you know, St Augustine said this as well. He said that there’s no such thing as the past or the future. There’s only the present past, the present present, and the present future. And he’s referring to that kind of presentism, I think, that exists across religions and everyday life. And that’s really where we only exist. DR: Well, I think an interesting and very important part of millennial thinking and prophetic thinking is that it places the individual right at this axis point of history. As you say, you know, it’s the memories of history: a narrative construction, leading to this point and you have various futures branching out. And something about apocalyptic and millennialism, when it becomes involved in violence particularly, is that sometimes it’s seen that in order for the future to go one way there has to be some sort of violent or cataclysmic change; which brings us to the issue of violence, then. Is there a necessary connection between millenarianism and violence? Or is that only in the popular imagination? JW: I couldn’t agree more. I see nothing within millenarianism that makes it essentially violent. And I think the other important point to make is that not only do we “other” millenarian groups, by often assuming that they are violent, but we normalise ourselves – the secular, the non-religious, the mainstream – as something that is somehow essentially non-violent. So we make cults and sects and millenarianism essentially violent and we make the mainstream somehow essentially non-violent. And I think both are completely false. The evidence just does not stack up. MM: And, of course, we’re sitting here at the Panacea Society, which was a millenarian movement that was not at all violent, so . . . . And, in fact, probably the vast majority of millenarian movements are not violent. It requires a certain set of circumstances to lead a millenarian movement to violence. And the vast majority of them don’t have that set of circumstances. TS: Can I add to that? TS: I guess I’m interested in the way we’re using the word “violence”, here. I think we’re talking about overt, coercive types of violence. But I think discourse or language can be violent as well. (15:00) I think certain other, “small v” forms of violence take place as well. And they take place outside of . . . they’re not exclusive or endemic to millennial movements, they happen in everyday life. I’m speaking here of a kind of power that we exact on all sorts of things. And millennial movements, apocalyptic movements are a different kind of normative discourse and they challenge the dominant normative discourses that Joe was just talking about, right? In a sense they’re kind-of doing a violence: they’re trying to change the way we think about the world. Our normative way that we think about the world is not the right way, it’s not the absolute truth. It’s truth because more people believe it than often the millennial and apocalyptic movements. That doesn’t mean there’s not a kind of violence that’s going on there: there is. EB: I’d like to add that a lot of the movements are actually pacifist and they work hard for pacifism. And it’s very interesting that today, while this is being recorded – April 6th – the Jehovah’s Witnesses are – perhaps it’s already happened – being threatened with entire extinction from Russia, because they are absolutely non-violent. They’re in prison in places like South Korea because they’re conscientious objectors. They won’t kill. They’re prepared to be killed. They were killed in Auschwitz, for example. Unlike the Jews and the homosexuals and the Gypsies, who were going to suffer anyway, the Jehovah’s Witnesses could have said, “No, we’ll obey the state”, and they didn’t. They preferred to be killed rather than this. EB: Because they just refused to do certain things. And the group that you were talking about today, also tried to be pacifist. And so it’s not just that they’re not violent. They will work against sometimes. But of course, some are violent with a capital V.
MM: Yes, the group that I was talking about today was historically the Bábis of Iran. They were a precurser of what is today the Bahai faith. But in mid-19th century Iran they were a group that became very popular, spread very rapidly. And the leader of this group worked very hard to diffuse the violent possibilities, because he claimed to be the Mahdi – and people were expecting the Mahdi to come and lead an army to victory. So they were expecting a violent result from Mahdi coming, and the Báb worked very hard to diffuse that potential for violence. And, really, one of the main factors that eventually did lead to violence, as a result of this movement, was the fact that the Báb was removed from his ability to lead his followers. Because he was imprisoned in a fortress, right up in the northwest corner of the country, and therefore cut off from his followers and prevented from leading his followers in the way that he wanted to. DR: Did you want to add something there, Joe? JW: Well, this is an issue that we’ve been discussing throughout the day. I think, when we speak about violence, when we speak about the way in which pacifism within new religious movements is often ignored . . .
EB: Or, seen as dangerous and violent! JW: Indeed. . . where the refusal to fight becomes a type of extremism. I think, connected to this, is the way in which, in some cases scholars, and in other cases political entities – governmental agents – try and explain away millenarian movements rather than explain them. And, I guess, by that I mean that they have a tendency to look for external causes of behaviour: explanations which, wholesale, refuse to countenance the possibility that the local native account – emerging from within the religious movement in question – might have something to contribute to an understanding of why that movement is doing what it’s doing; or in some cases, not doing what it’s not doing, for instance, fighting. So if we try, as scholars, to begin to break down the idea that religious movements are saying and doing one thing and on the other hand our job is to analyse them in ways that are alien to that movement and external to that movement; if we begin to break down that process of explanation, I think we might begin to have a more fertile understanding of what new religious movements are, or what millennial movements are. Because we can learn things from them in ways that very often we simply refuse to acknowledge. DR: Absolutely. (20:00) And that’s something I talk about a lot, especially. . . . It’s part of the heritage of Religious Studies to be talking about beliefs, and particularly about deviant beliefs, and sometimes going as far as pathologising these kind of ways of viewing the world. But your work, I know, is talking about things that are very relevant to today: you mentioned Trump earlier on. And when these political movements, for instance, suddenly start to engage with other millenarian kind-of ideas, I think it shocks people when they actually realise, “ well, maybe this is more normal” than they perhaps realised. TS: I think there’s a couple of things going on here, right? Let’s start with Trump. One of Trump’s main security advisers, Steve Bannon, has his own millennial perspective: something he calls the Fourth Turning. He gets this from a series of books on generations, which is a kind of secular apocalypse: that the world is getting bad, capitalism is being destroyed, traditional culture is being broken down, and he needs to take action to do something about that. In other ways, some millennial groups align themselves with political groups, right? And maybe their action is something as simple and normative as voting. It’s not really taking action. In fact, many of the groups that I study – Christian Zionists [for example] – are fatalistic. They’re pacifists, in the sense that they don’t actually take any kind of physical action, but they might vote. But we might even argue that doing nothing sometimes is still taking a side, right? So the groups that I study, the Pilgrims – the Christian Zionist programmes from the United States, going to Israel and Palestine – they’re not doing anything to contribute to the conflicts that I write about, directly. But indirectly they are, insofar as they support a tourism industry; they support a particular political ideology, both in Israel and America that might actually take physical violence, or take the form of physical violence. So, in a sense, they’re pacifists but they’re still involved, or part of the assemblage of violence, I would argue. DR: So when violence does arise, then, what is difference? What happens there? What is the process by which a group minority or majority becomes violent? I mean, there are well-known cases, obviously: Waco seems to be the sort of paradigmatic account today, at the conference; but Heavens Gate as well; Jonestown. What is it that causes violence in these unusual cases? EB: Well, they’re all different. Part of our job, as scholars, is to look at the particulars in order to try and compare them, in order to see the similarities and differences, and pull out some of the threads and similarities. But there aren’t a certain number of similarities, and the other things are different: there are groups; there are categories; there are clusters; bundles of things that seem to go together; and the sort of tension that Joe was talking about earlier between the internal reasons and the external reasons – and Stuart Wright had a paper, today, which talked about this – and the importance of seeing the interaction between the two. And you can’t predict by doing one or the other: it’s seeing how the two react on each other. And these can lead to spirals of what criminologists call “deviance amplification”: each side does something that’s slightly bad in the other side’s view and gives the other side permission to be slightly worse. And so it grows. . . and then – wham! And Waco is an example of that. But Waco is very, very unusual, thank goodness! There are cases where you can see this writ large – and they’re easy to see – and therefore we focus on them, because they give us a kind of template, or an idea, against which we can measure the other movements which are not like that. And I think it’s very important that we keep remembering that they’re not like that, and that we look at the other ones and take those into our calculation, as well. I think that’s important. I think the reason why Waco – or perhaps another example would be Aum Shinrikyo – becomes paradigmatic is because, there is some sense in which we’ve already come to the study of Millenarian movements having decided that they are somehow profoundly different to religions at large. And therefore, by a process of scholarly selection by us, we simply focus on those cases which fit the paradigm. (25:00) This is the classic case of “normal science”: that we simply look for evidence which fits pre-existing paradigms and conveniently – or, in some cases, very inconveniently – ignore all the other counter examples; and the theories – or, in some cases, prejudices – that we have of these groups are wrongly reinforced. And another consequence of this is, as Eileen says: many of the groups that are committed to non-violence – or don’t even feel the need to commit themselves to non-violence because they are so inherently non-violent that that commitment doesn’t need to made – that those groups are simply ignored. Many people don’t focus on those groups because they simply don’t fit the prejudices that we seem to have within the scholarship. EB: I think we have to make the distinction between the violence that is done to a group and violence that the group does. And nearly all the violence is done – again with a capital V – is done to their own members. Some are done to people that they know, personally, who they don’t like. And very, very few are done to strangers: Aum Shinrikyo is an example, but one of the very few; the Manson family is another one. But, mostly, the harm is internal rather than externally directed. Most of them expect that God, or something, will happen: the Apocalypse or Armageddon will happen. Now, they might have to be the midwife – and that’s another quite interesting question that we haven’t touched on yet, is: what happens when prophecy fails, when they expect this great big change? But I think it’s important to remember that very, very few go around killing people. That tends to be the traditional major religions – the churches and the denominations – who’ve got the money and the armies. Now, of course, it might be different if they get hold of sarin gas or something, but this happened very much . . . .
DR: This ties into what you were saying before, about the importance . . . . We have to generalise, to some degree, to make cross-comparisons, but we have to remain aware of the important differences all the time. And, a lot of the time, these groups that we’re comparing – the actual violence that we’re talking about is very, very different. And you also have cases like Heaven’s Gate, where there’s very little evidence of coercion there. I mean, if you watch the exit videos that the members shot, for instance, they’re going quite happily into that situation with their eyes fully open. It’s only from our external point of view that it can be described as violence at all – largely because of going into it, or looking at it, with this kind of brainwashing mentality that earlier discourses on new religions bought into, which is very much discredited now. EB: And they were only harming themselves. EB: And Joe ought to jump down on me immediately, because they didn’t see themselves as harming . . . .
EB: They saw themselves as being ‘transitionised”, or whatever the word was? JW: Going to the level above the human, TELAH. Yes, I think that’s a really interesting point: that what he have here is – to bring it back to your question about failed prophecy, and this does link to violence . . . . Whether or not we can genuinely point to groups like Heaven’s Gate; or classic historical case studies like the Millerites; or Festinger’s famous book about cognitive dissonance, using the Seekers – even if we leave violence in the equation, or if we take it out – there is still the enduring question about: does prophecy for these groups ever fail at all? JW: Well see, I’m not so sure about that. When I think about Heaven’s Gate I think about the fact that they ended their lives and – as far as we’re aware, as far as they’re aware – made a successful journey to where they were going. The same, I think, can be said with the Seekers and Mrs Keech: the idea that the prophecy did not fail, the flood didn’t fail to arrive, it wasn’t a failure, it was them successfully spreading enough light to call the floods off. The Seventh Day Adventists did not explain away a failure of Millerite prophecy. It seems to me that Ellen White simply realised that Miller’s prophecy was correct but that the revolution began in heaven, not on earth. So, I’m intrigued to hear your pushback on that. In what cases does prophecy really fail? EB: Well there are some groups that have said, “Oops, we got it wrong!” (30:00) I can’t remember his name. The man who – it was May sometime about 4 or 5 years ago – Radio something . . .
EB: Now, he said . . .
DR: After a couple of events, yes! EB: And, at that time, he said “God got it wrong”, according a newspaper headline! DR: Which is one of the techniques mentioned in Festinger’s books, actually: that the transmission was garbled and – reception issues. EB: You can get the reception wrong; you can have it happening in the spirit world – like with Joanna Southcott and lots of others; you can have people saying, “Well, because we did this, we stopped the terrible thing happening”; or you can say, “Because they didn’t do this, God didn’t come yet. We weren’t ready. We didn’t listen to the Messiah, telling us what to do.” There are a whole lot of different ways out. But there are those that . . . . There was a chap – again, I can’t remember, I want to say Garland – he was a Chinese chap in America. And he said, “I’ll come out and apologise if nothing’s happened.” And he came out and apologised. This was about ten years ago. He was Chinese, or he was Oriental of some kind. DR: Well, hopefully, one of the listeners can tell us who it is in the comments. EB: I’m sure they will. And provide other examples. DR: I hope they do. TS: I want to add to this conversation about “small v” versus “big V” violence. I think, one way in which small v violence takes place is . . . Harold Camping is a good example. A lot of people – thousands of people – sold their houses, they went into debt; they expected this to happen. That had a tremendous amount of violence on their families and their lives. They moved into forests, they bought bunkers. This is a form of violence, right? I think another form of violence, that wasn’t really talked about in the conference, is spatial violence: the way that these groups imagine spaces in particular ways; homogenised spaces; map spaces; understand whole groups of people in homogenised ways and treat them in certain ways. And some of these groups are aligned with state power. Sometimes the state see them as a threat, and disciplines them with large V Violence. And sometimes they align themselves with the state: with large V Violence; by their voting for them; by their interests. We’re seeing this at the moment with Donald Trump – he’s doing all sorts of violence to homosexuals, to women’s rights over their body, these sorts of things – aligning themselves with larger Christian movements like Christian Zionists, like pre-millennial dispensationalist, right. . . that are doing violence to all sorts of other people within the electorate. And also, in terms of foreign policy, the way that Americans understand Muslims, the war in Iraq, right? These are all contributing factors. I think maybe the mistake, then, is to look at just the millennial movement. You have to see the effects that they have outside of their movement, right? Their social effects. Look at Marxism, for example. This is a good example . . . . Or another point, maybe, I want to make is the difference between belief and practice. So, we have textual beliefs – we have written documents, for a lot of these groups – and then we have the way people actually act, which are two different things. You know, would someone say that Stalin was a true Communist – a true Marxist – who murdered millions of people? Is that an example? Marxism is a form of millennialism: it’s clearly interpreted and was influenced by Jewish and Christian thought, in the way that there is a kind of . . . . Capitalism kind-of reaches a point where it can’t abide, it fails, and then we have a kind of proletariat millennialism afterwards. So the practice and belief is also a discussion that we need to have, within these discussions. DR: Unfortunately, I’m going to have to do small v violence to the conversation and to return to the subject of time! We have been talking about this all day. We could continue to talk about it all evening, and we will be talking about it again, tomorrow. For the viewer and listener I urge you to check out the millennialism, on new religious movements, on violence and these kind of issues. Other than that, I would like to thank all of our participants for taking part. And thanks for watching. 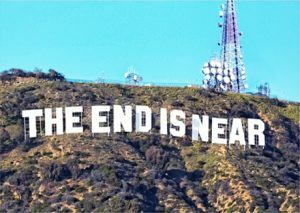 https://i0.wp.com/www.religiousstudiesproject.com/wp-content/uploads/2017/05/End-Is-Near-Hollywood-Apocalypse-Sign-T-Shirt-500.jpeg?fit=460%2C326&ssl=1 326 460 Thomas Coleman III https://www.religiousstudiesproject.com/wp-content/uploads/2018/08/logo.png Thomas Coleman III2017-05-22 09:00:372017-05-25 07:58:59Millennialism and Violence?